This entry was posted in Fibre and tagged Art Yarn, beehives, handspinner.co.uk, jacey boggs. Bookmark the permalink. How does it knit up I wonder? Big needles maybe. Would look interesting!!! I really miss my spinning as I am living in Egypt and all my spinning equipment is in the UK! I have bought a small black sheep however to start my flock off with so hopefully I can have some wool soon. Its so hard to get wool here!!! I can’t imagine knitting with the beehives, maybe you’d have to carry them across the front of a few stitches to leave them in one piece? It would be interesting to try! At least with just one sheep you will be able to keep a close eye on its fleece as it grows and give it a quick shampoo and conditioner treatment if it looks a bit out of shape! That is really beautiful. I’m not really into textured yarns, but yours is so pretty I’d want to just hang it on my wall and live with it. I like your idea of weaving with it but I’m not a weaver so don’t know how that would work. Are the bumps spaced such that they would work up between your warp threads? Thanks Kris – I am spinning some black merino to use as the warp and it will be interesting (or possibly a disaster!) to see what happens when I try to weave. I think the beehives will be fairly randomly spaced and I might have to bring them to the front and keep them over the top of the warp threads to stop them from getting squished? As it will be only my third weaving project it will all be rather experimental anyway!! Please show us what you’ve done with it! 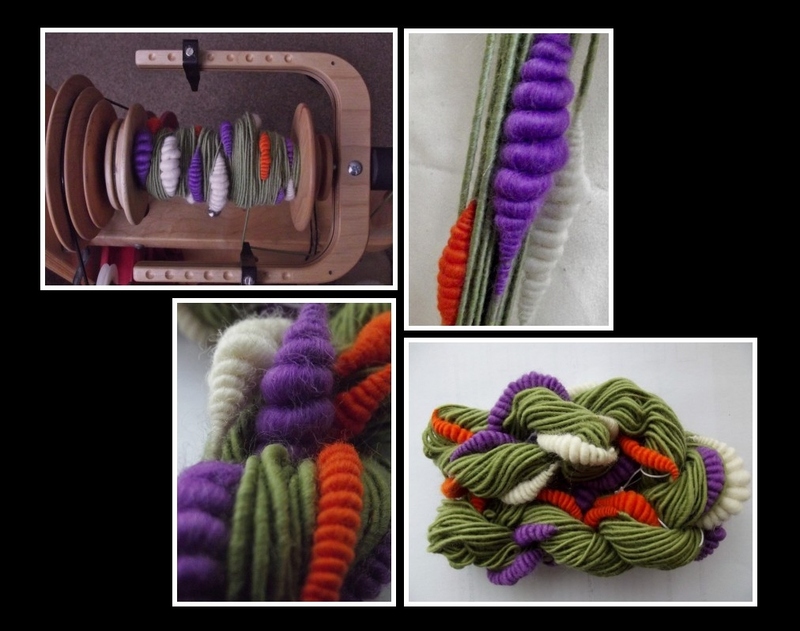 Thank you – I am a bad spinner, I have a habit of spinning things and then spinning something else instead of using what I’ve spun… The Crocus Yarn in still in its skein. I spend ages choosing and buying wool for a project… but having done this I’m a bit bored and months later come across the wool and think ‘what did I buy that for’ having never started it! What a spectacular job on your yarn! Because of your fabulous result I’ve now had to investigate more about this book. I now know I must have it. Thanks so much for this post – which is totally inspirational. If my spinning turns out half as good as your pic I will be over the moon! !